(RT)A new radio telescope located in a remote desert in Western Australia has enabled scientists to spot a galaxy as far as 5 billion light-years away, expanding our knowledge about a little-explored period of the Universe’s history. 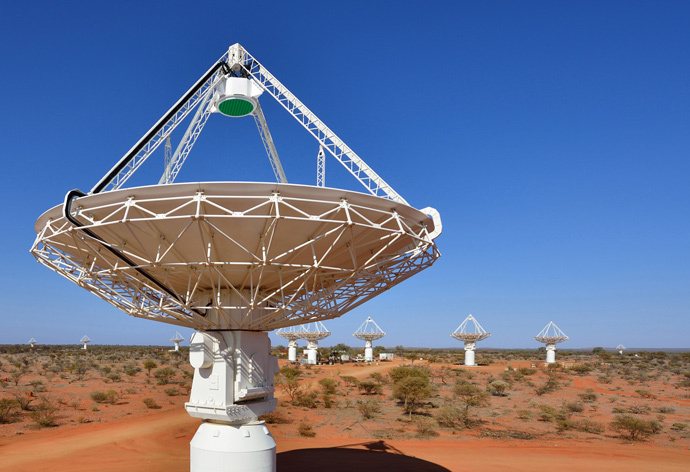 Six dishes of the high-tech radio telescope, known as Australian Square Kilometre Array Pathfinder (ASKAP), have detected a weak signal, emitted prior to the birth of the solar system. 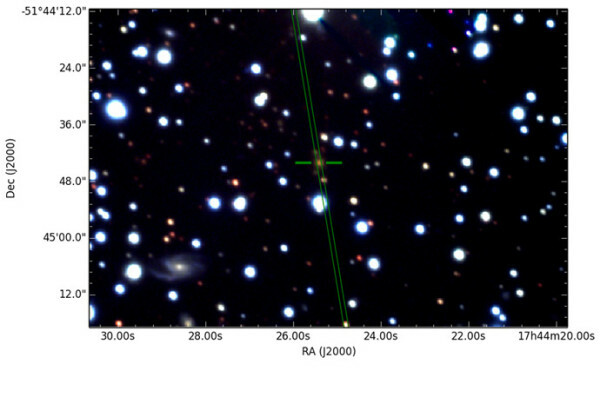 It comes from within the bright center of the galaxy PKS B1740-517, located near the Ara constellation. ASKAP, located at the radio-quiet Murchison Radio-astronomy Observatory (MRO), boasts a totalcollecting area of approximately 4,000 square meters, from 36 antennas, each 12 meters in diameter. The telescope can pick up signals from galaxies in the distant universe that are sources of radio waves, Elaine Sadler, a professor of astrophysics at the University of Sydney, told Mashable Australia. She explained that these galaxies actually emit such waves because they have huge black holes at their center. “If that radio signal passes through hydrogen gas, it makes a signature at one particular frequency, like tuning into a radio station,” she said. “That can tell you the distance the hydrogen has travelled, and that’s what this telescope measures,” Sadler pointed out. The 5-billion-year-old radio emission, detected by ASKAP, was stamped with the “imprint” of hydrogen gas it had traveled through on its way to Earth, researchers stated on Australia’s national science agency’s (CSIRO) website. What happens is that the gas absorbs some of the emission, creating a tiny dip in the signal, the researchers say. “At many observatories, this dip would have been hidden by background radio noise, but our site is so radio quiet it stood out clearly,” Dr. Allison, who led a research team, noted. The MRO has proved to be the place-to-be for radio astronomy since it exhibits “excellent sky coverage, superb radio quietness, ionospheric stability and benign tropospheric conditions,” according to CSIRO. The extremely low levels of radio-frequency interference makes it possible for highly sensitive instruments like ASKAP to conduct innovative astronomy research. According to Allison, the recent discovery makes it clear how “ASKAP can do what other telescopes can’t.” Other discoveries are likely to be made after another 30 satellites of the telescope come online next year. The next challenge is to find hundreds of galaxies that are up to 10 billion light years away and determine how much hydrogen gas they contain, the researchers say. It’s hoped this could help astronomers understand why star formation, fueled by hydrogen gas, has dwindles in the universe since its heyday about 10 billion years ago.